The WBNA has been working hard for some time now to build their green building at 1577 Westminster Street. Delays have been caused largely as a result of putting together financing for the project. I’m told that WBNA and their partner, SpurwinkRI, now have a building permit in hand and construction could begin as soon as December 23rd. If the winter construction season cooperates, the building could be done by next fall. The building will have many green features including solar panels, insulation made from recycled newspaper, and flooring made with corn oil instead of petroleum. 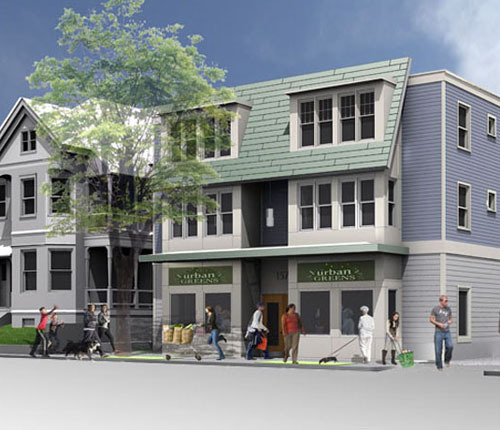 It has 7 apartments above that are supported living for folks with developmental disabilities, and the ground floor is still planned as Urban Greens’ new retail space with a full range of local and organic veggies, dairy, meat, and dry goods. We’re looking forward to this excellent project finally coming of the drawing board and getting built. That is terrific news for the neighborhood and Providence in general! I know how hard Kari and WBNA have been working at making this deal happen. Hurray! Equipment was delivered last weekend, perhaps Monday 1/4, and light work has been done thus far to clear the site. A truck currently sits at the back of the lot, which has been moreso cleared of brush and remaining debris. My bedroom window overlooks the site from Bainbridge Avenue.. so this is a welcomed sight that will finally eliminate the not-so-pleasant view of overgrown weeds and brush.. and add a great new venue to the west side! ProJo has an article today about this project.